Most of the time when I’ve been abroad I’ve been by ferry (I was lucky enough to go on Eurostar back in May but that’s a whole other story!) back in 2005 I went to Turkey for a week. It was the first time I was going on an aeroplane and was a little worried that my suitcase might go walkies – so in my rucksack I had with me in the cabin I had my toothbrush, and a change of undies amongst other bits and pieces to tide me over if needed. My tag on my suitcase would have identified me and where I lived but would have been no good if I was in Turkey for a week lol. 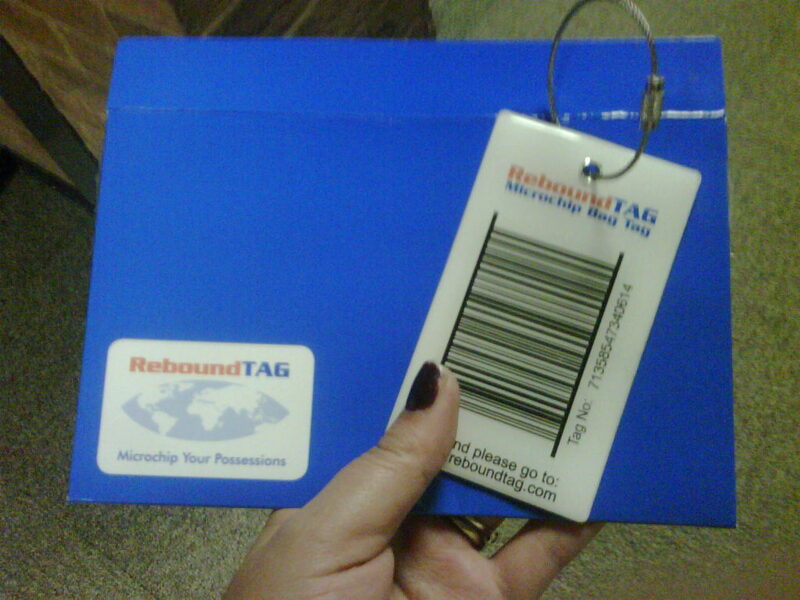 So this is a genius idea – it’s called Rebound Tag. A lot of security companies recommend that you don’t put your details like your address etc on the tag that you put on your case – so instead you can put the rebound tag on there. Rather than your address being on show to the world there is a microchip number which can then be typed into the website (http://www.reboundtag.com) and then you are notified by SMS or email that your suitcase has been found. I was sent one of these tags by FuelMyBlog to review – now obviously I hope that I don’t lose my case and I didn’t want to leave it behind on purpose to see what happened – however I have registered my tag and have it attached to the bag that I use everyday just in case it’s stolen or something like that. It was quick and easy to register my tag – although the barcode number on the tag is quite long it’s easy to read. Also when it came to adding my holidays to the website it was easy again, I’d added my main holiday within a few minutes – the bit that took the longest was actually looking for the holiday park phone number rather than the actual process of added the itinerary details. You can buy a single tag for £19.99 from the website. The company also sell family packs (3 tags) or an Executive pack which is 10 tags. It is a lot more in comparison to a plastic key ring with a piece of card in it but you do have the piece of mind that your address etc isn’t on show to the world. My main negative points would be the size of the tag – it’s 10cm x 6cm – when I had it attached to the outside of my handbag I kept catching it – at the moment it actually lives in one of the pockets, however with it being on my suitcase it was big enough to identify what it was. The other issue would be with regards to the pack sizes, having come from a family of four we would have had a suitcase each which would have meant buying a pack of 3 and then a single one – I think a pack of 4 or maybe even 5 would be a good option as well for larger families etc. On the other hand I really think that it’s a good idea and I would consider purchasing another one for CJ’s case if and when we go abroad again (via plane because it’s hard to lose your case in a car lol). This is a Sponsored Post, the product was supplied by Rebound Tag via FuelMyBlog and the opinion is all mine.